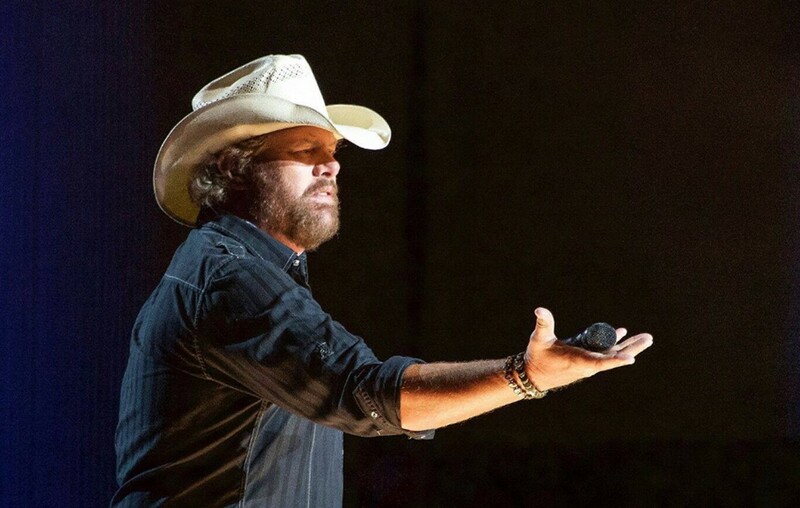 This collection of Toby Keith facts are worth a look! Find out more about his career, family, movie roles, and more here! Country music star Toby Keith, 57, has released nineteen studio albums, two Christmas albums, and five compilation albums over the span of his successful country music career. The Oklahoma native has also charted sixty-one singles on the Billboard Hot Country Songs charts, including twenty No. 1 hits and twenty-one additional top 10 hits. Thus far, he has sold more than 40 million albums worldwide. Enjoy these additional Toby Keith facts below! 1) What is Toby Keith’s real name? The star was born Toby Keith Covel to Carolyn Joan Ross and Hubert K. Covel, Jr.
2) Where did Toby Keith grow up? Toby was born in Clinton, Oklahoma and lived in Fort Smith, Arkansas and Moore, Oklahoma as a child. His interest in music was sparked as a child when he visited Billie Garner’s Supper Club in Fort Smith, Arkansas, which his grandmother owned. During the summer, he did odd jobs around the supper club and sometimes played music with the band. 3) Who is Toby Keith’s wife? Toby first laid eyes on his future wife, Tricia Lucas, at an Oklahoma nightclub in 1981 when he was just 20-years-old and she was 19. After three years of dating, the pair got hitched on March 24, 1984 and have since enjoyed over three decades of wedded bliss. Toby and Tricia were honored with The Dean’s Award for Distinguished Community Service by @OUMedicine for their support of children and families undergoing treatment in the community. 4) Does Toby Keith have children? Yes. After marrying Tricia, he adopted her daughter Shelley and the couple went on to welcome daughter Krystal (born in 1985) and son Stelen (born in 1997) into the family. He is also a grandfather to two granddaughters and one grandson! 5) What job did Toby Keith have before becoming a country music star? The future singer-songwriter worked the oil fields for $50,000 a year while also dabbling in music He also played defensive end with the semi-pro football club the Oklahoma City Drillers to make ends meet. Once the oil industry hit a downturn, he took leap of faith to pursue a music career. Toby gave himself an ultimatum— have a recording contract by the time he was 30-years-old or give up on music as a career for good. 6) How did Toby Keith get his big break? A flight attendant and fan of Toby gave a copy of his demo tape to Harold Shedd, a Mercury Records executive during a flight. Shedd then went to see Keith perform live and then signed him to a recording contract with Mercury. 7) When did he find success in the country music industry? It didn’t take him too long! Keith’s self-titled debut album went platinum in 1993 and its breakout single, “Should’ve Been a Cowboy,” became the most-played country song of the 1990s. 8) Has Toby Keith ever had any television or roles? The star has appeared in Total Nonstop Action Wrestling segments and also participated in the Comedy Central Roast of Larry the Cable Guy. He also appeared several times on Comedy Central’s The Colbert Report and holds the distinction of being the only musician to receive a five star rating from Stephen Colbert on iTunes. Keith acted in the 2005 film Broken Bridges and starred in the 2008 movie Beer for My Horses. With Stephen Colbert after being inducted into the Songwriters Hall of Fame. 9) What is Toby Keith’s net worth? The entertainer’s music career and his various other business ventures have made him one of the wealthiest celebrities in the U.S. The July 2013 edition of Forbes magazine features Keith on the cover with the caption “Country Music’s $500 million man.” Forbes estimates Keith’s annual income to be around $53 million. So yes, he is worth a lot of money. Share these Toby Keith facts with other country music fans!